If you’re looking for something chocolaty, you’ve met your match. This cake is everything guys, everything. Monday was my dad’s birthday, and he’s big on bundt cakes. He also happens to be one of my favorite people in the world, so I of course wanted to make something he would love for his birthday, and a filled cake was just the thing. 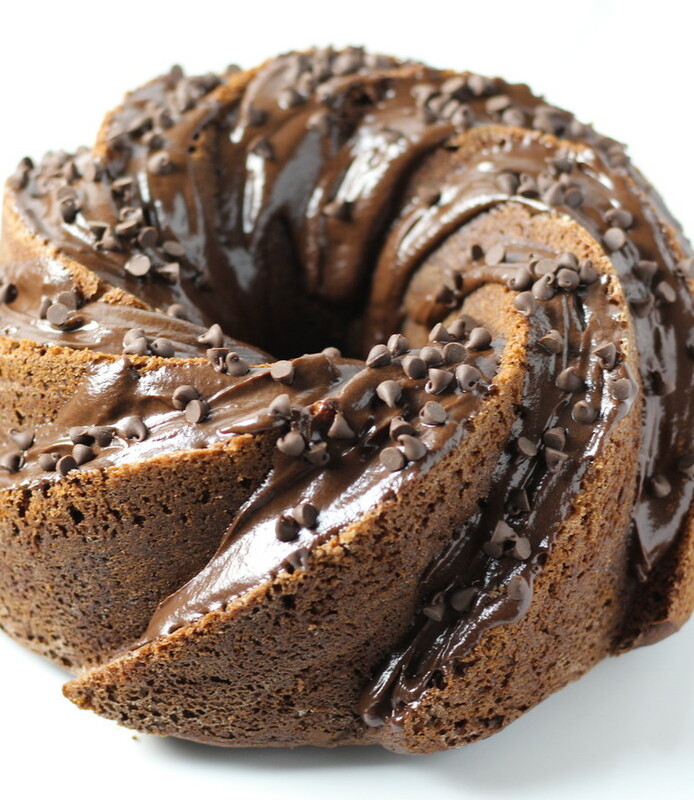 The cake itself is a devil’s food cake, which is known for it’s intense chocolate flavor, and tender crumb. The second chocolate addition is the ganache filling. For this cake, you actually want to add the ganache on top of the batter, and it will sink into the cake as it bakes, creating a sweet center. Lastly, we top this thang with more chocolate ganache, and a heavy handful of chocolate chips. If you’ve never made chocolate ganache before, it’s actually very simple and easy to put together. You can pour it over cakes like this one while warm, or you can whip it up for a thick, rich frosting, or you can even chill it to make your own truffles. Whatever you choose to do with the ganache, just make it! It’s too easy and fantastic to miss out on, and this recipe only has 4 ingredients! I hope you guys love this cake- Happy Birthday Dad! Preheat the oven to 375 degrees, and grease your bundt pan generously. In a medium bowl, whisk together the flour, baking soda, salt, and cocoa powder. In a large bowl, beat together the butter and sugar until fluffy. Beat in the eggs and vanilla. Add the buttermilk and flour mixture alternating, until completely incorporated. 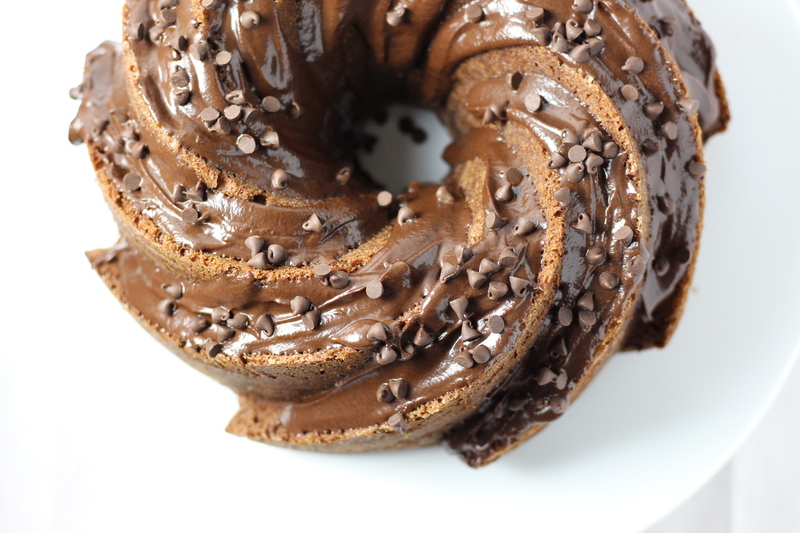 Pour the batter into your bundt pan, and set aside. Bring the heavy cream, vanilla, and salt to a simmer in a small pot. Pour the simmering cream over the chocolate chips, and whisk together until smooth. Spoon about 1/2 cup of the ganache on top of the cake batter in the bundt pan, being careful to not let any ganache touch the edges of the pan. (see photo above). Bake cake for 35-38 minutes, and cool completely. 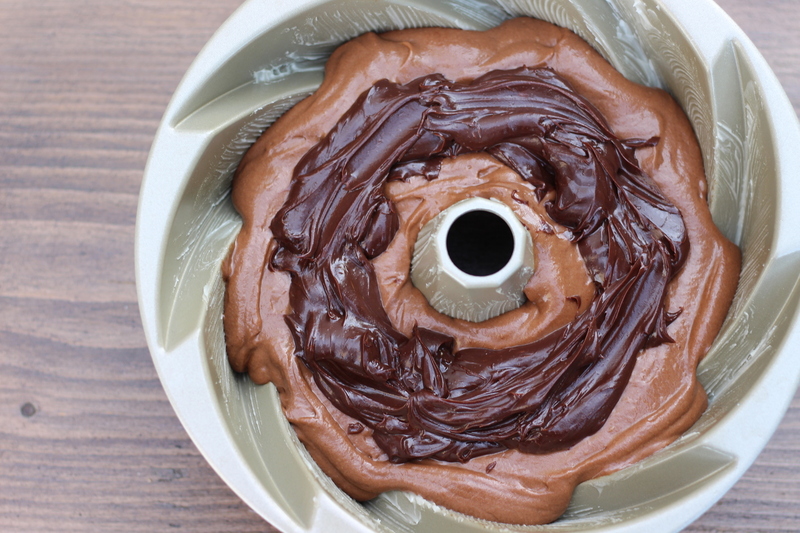 Turn out of the bundt pan, and pour the remaining ganache over the top. 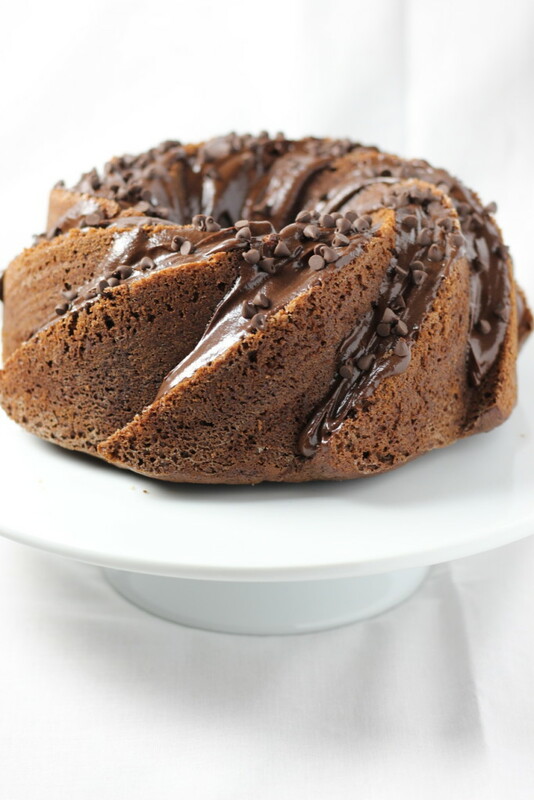 Sprinkle with additional chocolate chips!